Shopping Clutter: The Best Playground is rated 2.9 out of 5 by 17. 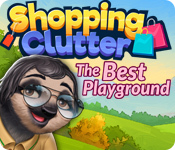 Rated 5 out of 5 by KateyBog from Cute Game for All Ages “Shopping Clutter: The Best Playground” is a very good and nice game which can be played both by children and adults. Our main task is to help the Walkers (animal family known everybody who ever played “Travel Mosaics” series) to make a perfect playground. Members of the family ask for an appropriate thing and you go to look for it in the clutter. Panther likes slides, Sloth likes everything calm and places to sit, Rabbit likes to move and activity equipment, and Squirrel just chooses nice things. I believe kids will like these dialogues. As to gameplay, it’s quite easy and understandable but sometimes challenging. Starting every next level you see what you have to do: find matching pairs, pairs of the same or different size\color, find three objects and so on. About 20-30 first levels are easy, but then the game becomes harder. Especially, when you have to find the objects divided into three parts, or collect only objects on the right panel (sometimes there are just silhouettes, and this is the hardest). Time is limited, so you have to be fast. I replayed the hardest levels twice to win. But this challenge is quite fun. The objects you have to find are different: big and small. Some of them it’s easy to find but others make you try harder. Music is cute and not annoying, colors are bright but don’t let your eyes get tired. For me, it’s perfect, the golden mean. I love this game and really enjoyed playing it. Rated 5 out of 5 by raydog from I love this game! Give it time! I love all clutter games but this one does take it to another level. Maybe people think the graphics are not perfect on some levels. I call that a better challenge. I love the weird color levels. I actually could not get through the one that had the items in three parts. On the other side, I love the characters and the puzzle levels. This is a wonderful game! Give it a chance! Rated 4 out of 5 by taurgem52 from Awesome mindless game I love these game. they help de-stress. I don't mind anything about it. Rated 4 out of 5 by MrsBen from LET'S BUILD THE KIDS A PLAYGROUND! I think this is a pretty good little game! I dislike timed games as much as others do, but, having played the entire first section during the trial game, I only had to replay 1 level once. Our goal is to build a playground for the kids...I added a spiral slide. Each level is different. 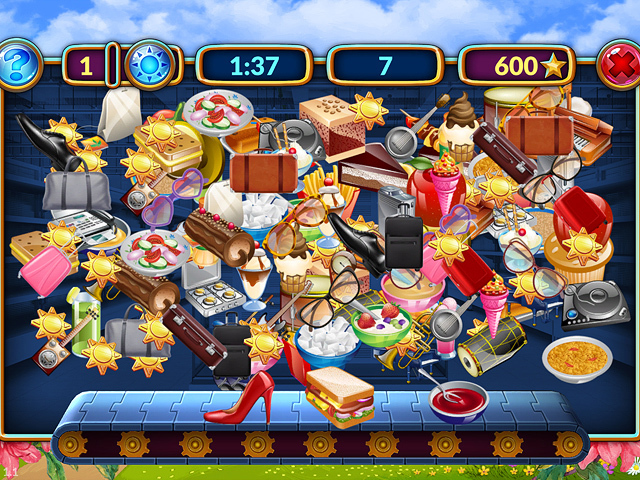 In one level, you search for matching items, another, you search for items of the same size, another requires you to find items of the same color, etc., etc.. You can move any of the items to the corner to get them out of your way, so that really helps. Rather than the blue crystals we normally gather, we have yellow stars to collect. My only issue with the game was having to click more than once on an item sometimes. After I finish this review, I am buying the game, because I enjoyed the quality and the gameplay. Rated 3 out of 5 by iou001 from Timeless I like the game but it doesn't have a timer. I don't like to be rushed. The graphics aren't the best and you need great graphics for clutter games. I'm glad I played the demo. I had to quit on level 3. I want to check out their Christmas game and see if it's any better. Rated 3 out of 5 by arnold1049 from NEEDS AN UN-TIMED VERSION This game needs an option to play without being timed. I cannot move the cursor fast enough on some of the levels. Or the time allowed should be increased. I would have rated it higher, except for this. Rated 3 out of 5 by cathybobcat from WHAT? NO RELAX MODE.....INGENIOUS The Biggest detriment to this game is it has a timer. When I play a game, I don't want to be timed whatsoever. There is no enjoyment in it. I couldn't believe this nine cent short of a dime aspect. In scenes, when the timer runs out, the whole screen empties and you are presented with the next scene where, for me, the timer ran out without my having found all of the matches. I was never able to complete the scenes because of the timer. There were also suns to collect, for what, I don't know. They didn't seem to be accumulative for hints like when you collect crystals in the other games. One thing I do know is collecting them took more time from the very limited amount of time you are given to complete a scene. You can replay those scenes if you want to improve your score. I am not into that. Then, for the KICKER.....On the last scene of a level, you must match 3 different size same items in the allotted time or you cannot proceed to the next level, so you are made to start over until you get it right. Well, guess what? I replayed this 2X and said, "Forget this noise", but when I did, the time ran out on my demo. How beautiful is that? I don't consider having to replay a scene over and over again until I go crazy a "Best Playground" in any way. Instead it is sheer aggravation. I liked the music and the scenes themselves were ok and had some variations as well as challenge. If it had a no timer mode, I would have bought it, but because of it being timed and my demo time running out, I will never know if I could have progressed past this match 3 different size items in the ridiculously short amount of time given. It's like going nowhere, fast....and there is nothing relaxing or enjoyable in that. Rated 3 out of 5 by bep1 from Not that bad This is an ok clutter game. There is a lot of dialogue but mostly at the beginning and tutorial stages. I just skip past what I don't want to read. It isn't the worst game, but could be better. I am still playing the tutorial so I don't know if it gets better or worse later. Help the Walker family clear through the clutter and find the necessary equipment to create the perfect children’s playground.